McGimsey Scout Park is a 140 acre camp in North Central San Antonio. 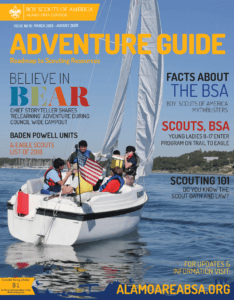 McGimsey hosts Cub Scout Day Camps, Spring and Fall Family Camps, Tiger Cub Fun Days, and numerous youth and adult leader training courses throughout the Scouting program. A full C.O.P.E. course with a Zip-line is located in the Park. The site is also available to all Boy Scouts of America families for unit camping and events with rental reservations. Click HERE or below to search for rentals to “Build Your Adventure”. For more information, email the McGimsey Scout Park team at McGimsey@AlamoAreaBSA.org. or for more information on “Building Your Adventure”, visit www.AlamoAreaBSA.org/Join or email Join@AlamoAreaBSA.org or call 210-341-8611 and ask to be put in contact with the Scout Service Executive who organizes Scouts in your area.